Retro is in fashion! The Lollipop Garden Dress is a vintage replica of a later mid-century three-piece dress and play ensemble. The basic shapes are classic and timeless--make them with the mid-century rickrack-and-button detailing for an authentic historical reproduction, or throw a modern twist to the pattern by eliminating the decorative detail and adding a tie or belt to the skirt. 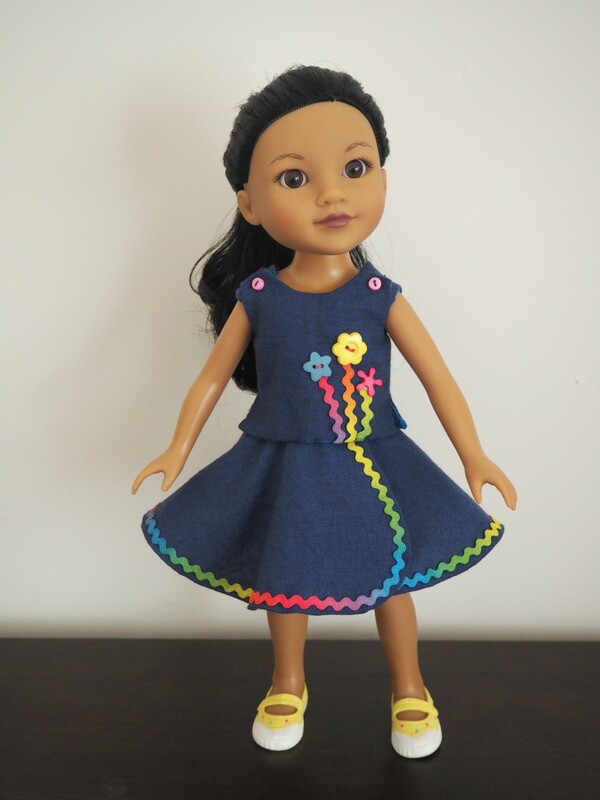 No matter how you interpret the design, your doll will be in style! This is a user-friendly pattern. The step-by-step directions have been photographed and written comprehensively with many explanatory details for newer seamstresses. An experienced seamstress will probably be able to sew this dress just by reading the written instructions located at the back of the pattern. Please note that this outfit was designed primarily for 14.5" dolls such as WellieWishers. As an added bonus, the outfit also fits 14" dolls such as Hearts for Hearts dolls. The Skirt fit will be a bit looser on most 14" dolls. The Lollipop Garden design is also available for 18" dolls separately. The pattern was easy to follow although the side split in the top was more difficult to create. The skirt is more full than it appears in the photo. It is such a cute pattern and used some of my button collection. I made two outfits and they are adorable.